Crown Foods are delighted to announce that they have won a Gold Award in the British Frozen Foods Federation Annual Awards 2017; Foodservice Best British New Main Course/Meal Centre Product for their MSC Gluten Free Bubble Coated Salmon Fillets. 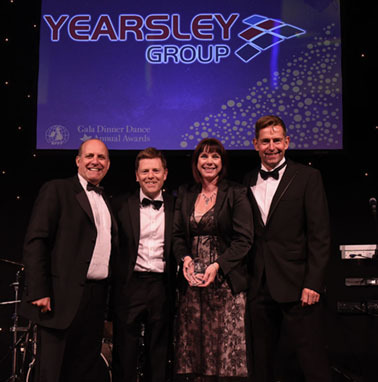 The award was presented at BFFF’s Annual Awards 2017 this month and accepted on behalf of Crown Foods by Trisha Rasor, Marketing Director and James Rasor, Product Assurance Director. The winning MSC Gluten Free Bubble Coated Salmon as judged by The Craft Guild of Chefs, are coated in a unique, crispy & crunchy Gluten Free coating, that are perfect for intolerances and can also be served as an inclusive meal for everyone. The bubbly texture as well as being delicious, adds real visual interest and appeal. Their Award Winning MSC Gluten Free Bubble Coated Salmon Fillet is a part of a fantastic collection of Gluten Free Fish products which include salmon and pollock and are perfect for children who love the satisfying “rice crispy crunch” of the gluten free coating. Their MSC Gluten Free Bubble Coated Pollock Fillet also received a nomination and became a finalist for the 2016 ASSIST Innovation Award. Eating something different to everyone else at the table is a frequent reality to those with a gluten intolerance or celiac disease. Gluten free foods have come a long way and the category is shaking off previous perceptions of dry and inferior taste. With more and more schools and indeed counties turning their menu’s entirely gluten free, these products are a great addition to any menu. 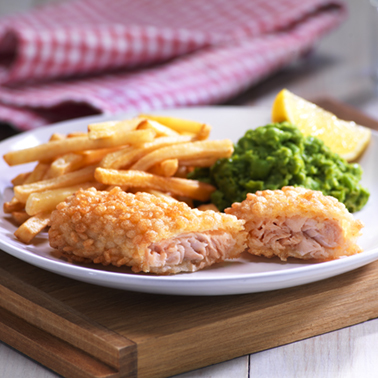 Their MSC Gluten Free Fish Range was primarily created to meet school standards and has already proven successful and well established, being particularly popular in Primary Schools. The 60g portions are a perfect size for children added 4-10 and are ready after 20 minutes baking in the oven. Following the successful launch, this product is widely available through Charles Sanders, Brakes, Bidfood, Holdsworth, Hopwells and Thomas Ridley. Main Image: Crown Foods MSC Gluten Free Bubble Coated Salmon Fillets.